The one thing I realised after finishing this book is that, even if you aren't too familiar with the comic book version of Barry Allen's Flash, you are left with a handful of nuggets that really help in summing up the newly reborn character. One of these nuggets is that the Barry Allen Flash is one of the few superheroes that Batman actually likes. This is significant because after Green Lantern: Rebirth, we learnt that Hal Jordan was one of the superheroes that Batman wasn't a fan of. But Batman likes Barry and Barry likes Jordan and it suddenly becomes apparent that Barry Allen does belong in the pantheon of DC Comics. Barry Allen died in the comics when the writer of this tale, Geoff Johns was just thirteen. Yes, he had a whole world of comics to explore when Barry Allen was the Flash but for a significant part of his life, Allen was dead. I enjoyed Rebirth as I felt the character was approached like a modern-era recreation by someone who is approaching him second hand and not simply rejuvenating the original take on the character. Johns has had experience with resurrecting comic book characters as he was the one responsible for bringing Hal Jordan back from the dead which served to show the readers all those cool things about his character that we had never seen before. Rebirth does the same thing for the Flash giving him some cool things that make us want to follow the character but they are made up for this tale and aren't true to the original source material. Still, like the reveal on the TV Show, I like how it is revealed that it is the Reverse Flash who killed Barry's mother. It is revealed to the new readers of Barry Allen's Flash that he likes wearing bowties and is considered one of DC Comics longest running patron saints. But it is interesting that Barry repeals the idea of him being saintly as we learn again that he had snapped the Reverse Flash's neck before Allen himself had sacrificed himself. What we didn't know, which is a new spin on things is that Barry never wore bowties before Iris, the woman who would one day become his wife, brought him to apologise to him on their first date. But there is something evident that we really learn in this book. Barry is too stiff for modern audiences so he needs a cool villain to make him cool for new audiences. And while Rebirth marks the return of Barry, it also apologises for his lack of coolness. We get some cool cameos throughout the pages of this book including Jesse Quick, Jay Garrick, Wally West, the Flash at the time of this books publication, Impulse, Kid Flash and Mercury Max. Wally's villains, Savitar and Lady Flash also make some appearances only to fall foul of the Reverse Flash's plan. 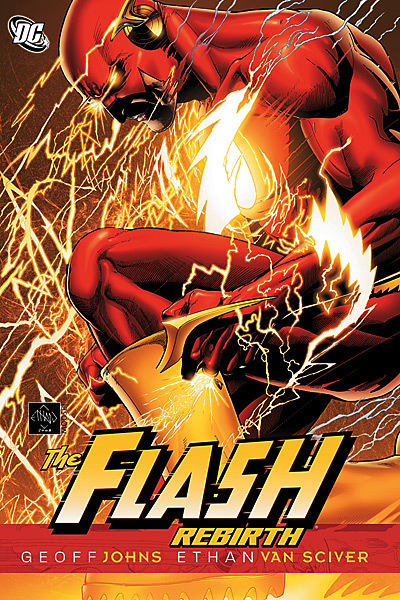 It is unfortunate then that to really enjoy this tale, you need to have some knowledge of what came before in the Wally West Flash tales. Where Green Lantern: Rebirth felt expansive, The Flash: Rebirth feels more insular. And while Johns goes to great pains to suggest that Barry is far from perfect, he also displays why he is possibly the greatest superhero ever, who created the Speed Force, a strange energy, which, when inside, holds the answers to every question in the universe. The Flash: Rebirth is always going to be one of those key stories for the Flash universe and fans of Barry Allen. It is a shame that this great tale is let down a little by the fact that fans need to have extensive knowledge of what had come before. Still, this is a great book to pick up!